In the Southeast Asian region, loss of area under natural forests is largely driven by natural resources extraction and demand for more land for production of food and other commodities. Earlier this year, progress tracking of the 2030 Agenda for Sustainable Development goals for Southeast Asia revealed disappointing outcomes for Sustainable Development Goal (SDG) 15. The SDG 15 measures forests and forested land protection, restoration and sustainable use. Inspite of the regional trend, Vietnam has experienced a resurgence in forest cover over the decades, reaching 48 percent as of 2017. Vietnam hit its lowest coverage in 1990 at 27 percent due to the conversion of forested land into farms as well as leftover reactions to bombs and defoliants during the Vietnam War. The improvement has been attributed to the government’s move to restrict timber harvesting and processing for export, reforestation activities and natural regeneration. However, some are calling Vietnam’s improved performance deceptive, achieved at the expense of its neighbours, specifically Lao and Cambodia. 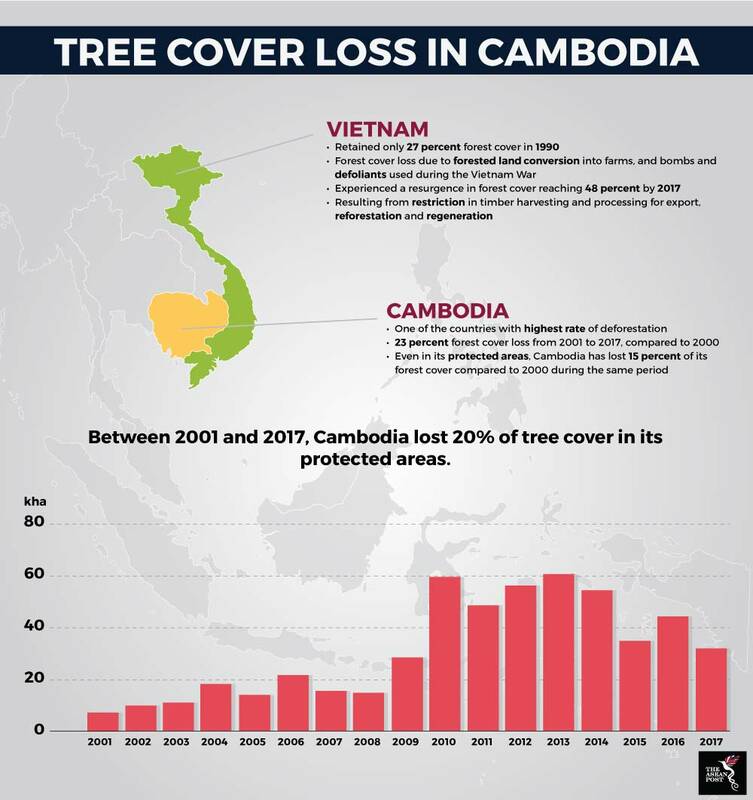 Cambodia specifically has been losing its forest cover at a serious rate, with 2.06 million hectares of tree cover disappearing from 2001 to 2017. This is equivalent to a 23 percent decrease compared to conditions in 2000. Even in its protected areas, during the same period, Cambodia lost 15 percent of its forest cover compared to 2000. Despite the restriction in wood harvesting and processing, as well as the revived forest cover, Vietnam is ranked fifth in the global wood and wood product exporters, exporting US$8 billion worth of products. This is an increase of almost 10 percent from the previous year. A report by the UK-based Environmental Investigation Agency (EIA) accused Vietnam of profiting from illegally cut timber from Cambodia. The organisation also identified a national park and a wildlife sanctuary in Cambodia where Vietnam-bound timber are illegally felled. According to EIA, clear passage to launder illegal wood - including those coming from protected areas - into Vietnam is allegedly arranged through various corrupt deals and illegal involvement of border army, cartels, logging barons, forest rangers, military, police and media. “Vietnamese officials have allowed Vietnamese traders to circumvent Cambodian law by allowing timber to enter Vietnam though unofficial crossings, avoiding inspection and taxation in Cambodia. Customs officials in Vietnam have legalised this timber into the Vietnamese economy, despite clear evidence of illegal harvest and export. Where this timber has not been legalised, these same officials have, at best, turned a blind eye to the huge volumes of timber being smuggled into Vietnam – if not outright profiting from this trade,” said EIA in its report. Following years of pressure from environmental groups and impacted communities, the European Union (EU) and Vietnam signed a Forest Law Enforcement Governance and Trade Voluntary Partnership Agreement (FLEGT-VPA) in October. The FLEGT-VPA will enable development of credible systems in Vietnam to ensure legality of timber and wood imports and exports. Through the legally binding agreement, Vietnam will establish and implement its own Timber Legality Assurance Systems (VNTLAS) to verify that timber and timber products have been produced legally. Once the system is in place, only FLEGT licenced products will be allowed to enter EU from Vietnam. This covers products such as fuel wood, sawn wood, veneer, particle boards, plywood, wooden flooring, wooden packing material, joinery, panels, wooden frames, and furniture. The VPA covers wood products harvested from natural forests, planted forests, rubber plantation, home gardens and farms by organisations and households. It also covers supply chain-wide verification against issues like land use rights, environmental protection, legality of enterprises, labour requirements, compliance to custom regulations and non-domestically produced wood. With the signing of the VPA, Vietnam is moving towards a stronger control over incoming illegal wood and wood products into the country. In the meantime, while the machinery is being developed, the challenge is to reduce illegal wood and wood products from continuing to cross the border. At the same time, stakeholders and industry players need to be prepared for the many changes to come.